I must press myself to write blog posts when I’m inspired. I often wait too long, needing more time to do research or frustrated by my struggles with grammar. Often times the posts never get done, they remain ideas in my head, the words long forgotten in the subsequent days. This is one such post. I’ve wanted to share this song since this blog started, it was going to be part of series of posts examining how the rhythm of certain songs matches the rhythm of travel of the respective music makers. 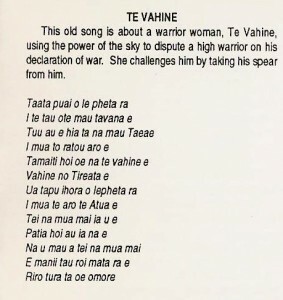 Te Vahine is one example. The rowing of the canoes, the sloshes of water against the vessel as it is propelled by dozens of arms and the energy of the ocean, I imagine these things gave this song it’s extraordinary rhythm. This song is so heavy with it, so compelling in it’s undulating movement of voices that I can’t listen to this song without some part of my body following the beat. It’s believed music was used by Polynesians as a form of oral tradition and to aid in canoe navigation. I would imagine the rhythm was equally as important as the words. 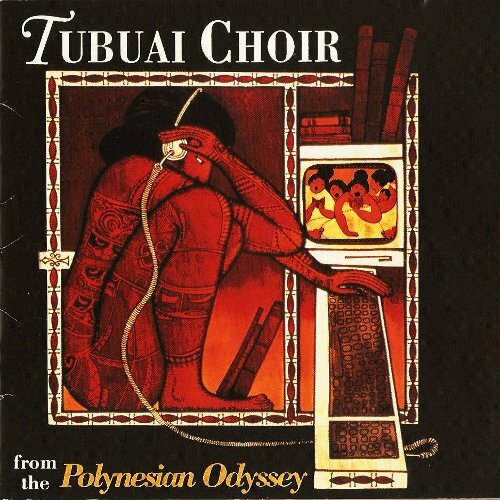 The song is performed here by the Tubuai Choir from the Polynesian island of Tubuai in the Austral Islands near Tahiti. While most of the island music suffers from the crush of Christian missionary zeal which systematically stamped out indigenous sounds and references from the natives’ musical repertoire, Te Vahine is one song that sounds like it could have been sung prior to the arrival of The London Missionary School. It lacks the touch of Mormons which makes it much more listenable than the rest of the album. 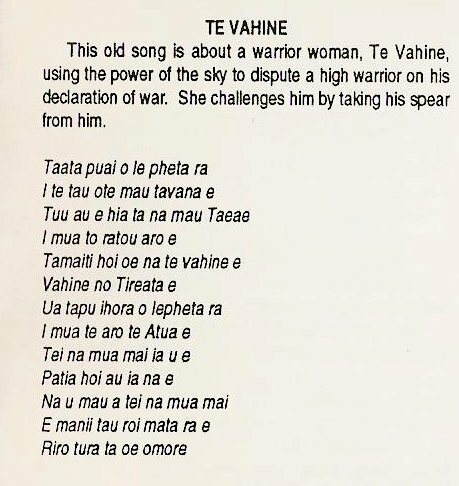 This old song is about a warrior woman, Te Vahine, using the power of the sky to dispute a high warrior on his declaration of war. She challenges him by taking his spear from him.